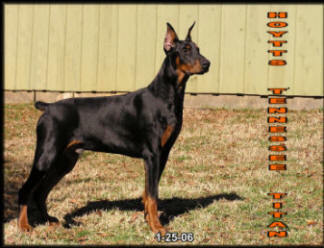 HOYTT...The oldest unbroken bloodline in the history of the Doberman Pincher. 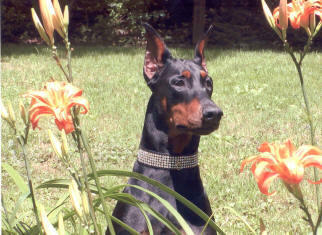 The Hoytt Dobe has appeared as cover dog on more dog magazines than any other blood line. 1968 saw the Hoytts offer the buyer a fully ( per the needs of the times ) medically completed Dobe. Including the crop and the best of the inoculations programs for the Dobe, eliminated the need for a new buyer to quickly locate, with only a few weeks window, a veterinarian who truly knew the breed and the important crop variables. In 1976, CBS produced a 30 minute documentary, Canines Against Crime which exclusively featured Hoytt Dobes in both the homes and businesses they protected. They were featured as guardians of the family and protectors of industry. The documentary also took a look at the workings of a kennel. In 1978, the Dog World Magazine featured the first professionally educated Dobe before placement for the home justly called The Custom Young Adult, for $1900.00. 1980 was the last time a Hoytt Dobe was shown to its Championship in conformation with our encouragements. 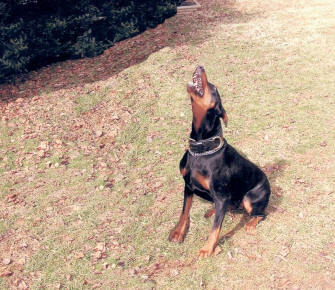 In 1982, we moved to east Tennessee and began exclusively showing off the Hoytt Dobe's mind with obedience and home refinements. From our youngest SP1 graduate pups to the evolution of the new American working Dobe, we are proud of our line. 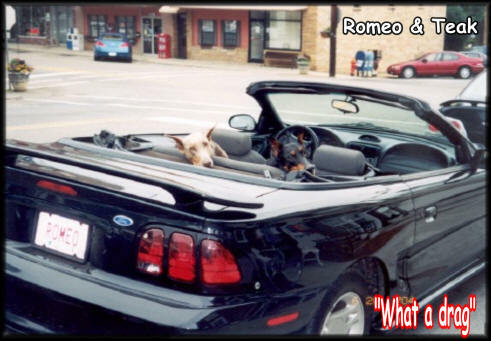 1984 introduced the Grand Victor for $9,700.00, the twin turbo charged version at the time of a canine bed buddy. This walking and traveling companion could go camping and trail exploration. Therapy and Service Programs, as well as work, was now very much sought after. At a more creature comfort level, the co-pilot and defender of the home, camp, motor coach, or SUV who naturally could be selected for a tolerance of those week end worriers. Yet these same best friends still can be your guardian of the realm. 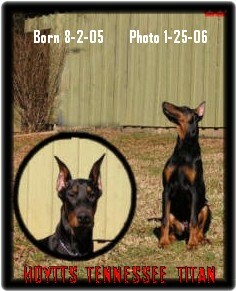 1998 three Hoytt Dobes all litter mates, received their CD titles at 6 months 13 days of age. These Dobes set a new record, but since then, our Grand Victors have continued to remain the youngest to receive their CD degrees. 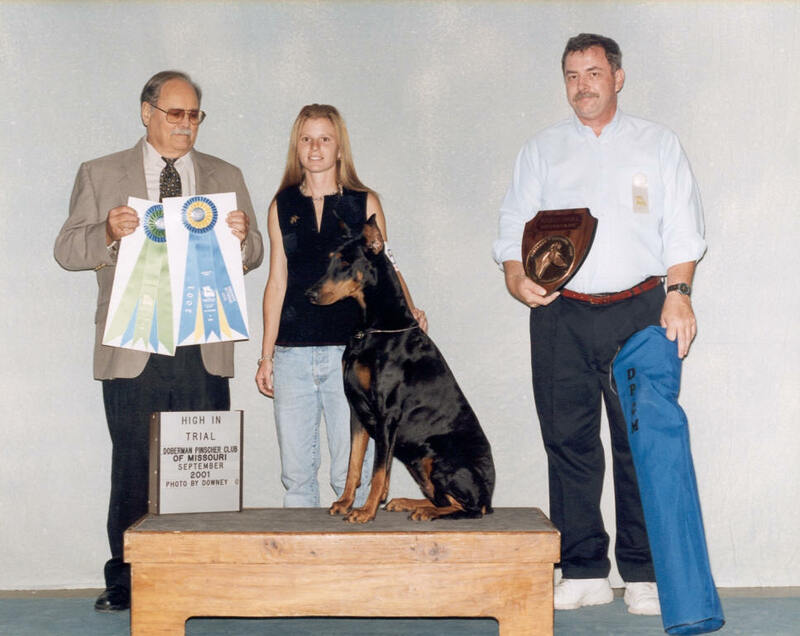 Since the 1998 wins of our kids finished it's CD degree at 6 months two days of age, at a two day show with a Doberman Specialty show, the pup was allowed to show in the DPCA show on both days, same location, under separate clubs - three different judges. 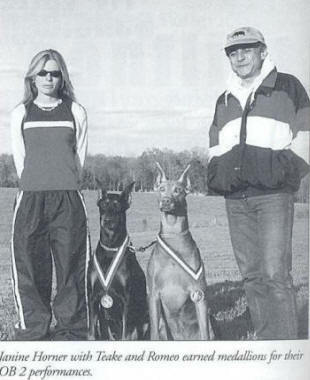 In 2000 our Grand Victor Program added Rally Obedience. In 2010, the youngest dog to go high in trial the first time in competition, also finished our Grand Victor program. 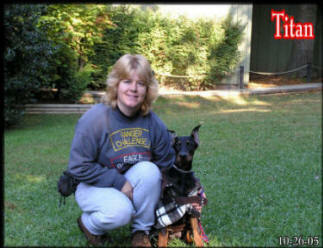 Hoytts Twist of Fate CGC RN CD will continue showing while serving as a Therapy Dog. To date, more Champions from Hoytt have appeared as cover dogs on both general and breed specific magazines. 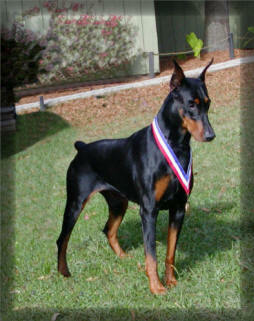 A Hoytt Dobe was the first Dobe in the United States to receive certification in Accelerate Detection (CADA). Cooper formally Hoytts National Treasure CGC TN CADA, also became the youngest dog to ever, by almost a year, to gain this degree and to date this honor remains. 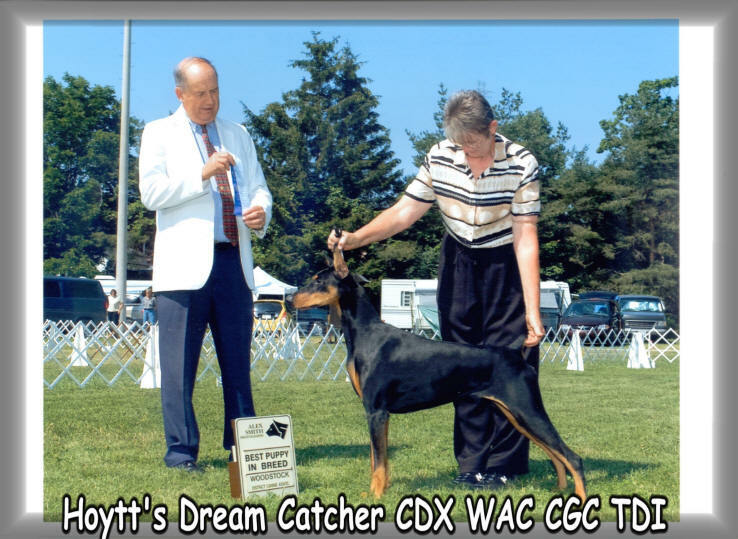 By mid 2011, we were the only kennel to see every one of our current and younger future breeders, those that will bring in the next generation of Hoytt Dobes, free of both negative DCM genes, using the new ( and only ) DNA test for Cardiomyopathy. STRANGE BUT TRUE... if you are new to the SHOW world of the Conformation ring you can not show a Dobe neutered or Spayed even if you have the most outstanding example of the breed . In theory, the clubs SIMPLY believe that these dogs, being non productive, they can not make puppies, WHY would anyone bother if no money can be made? 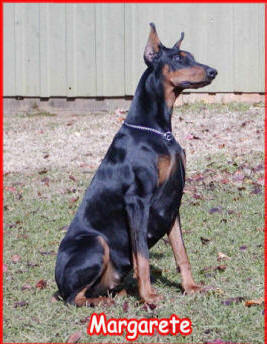 Personally, I have thought that each Dobe that shows itself off is a bill board for that breed or for the breeder of that dog, but, it seems that those in power are inferring the fixed Dobe is wasting the judges time! Why give it a win if it's not going to be available for breeding? But truly, many of our clients, while we were building champions, had the time, interest, and funds to go as far as their Dobe deserved. It does look like my perception, when my folks began showing, was to use the conformation ring like a upscale bill board. Based on these restrictions meaning if they can not produce why let them gain a Championship we stepped totally away from offering our breeders to the public, stepped away from the Conformation Ring and today only Hoytt Dobes matched by Hoytt with placement assured through Hoytt are welcomed into our breeding program. So now you better understand why we closed our lines for public breeding. We created what we wanted and simply wait for those who like what we do. But there are some great Conformation Kennels should you want to start your own line or just have puppies on your own. Remember to do it right go to the actual breeder of the Line you like not some second or third generation litter. For the serious buyer don't go dilute, just like Hoytt if the kid did not come from us it's just one more Dobe of composite linage that for the most part is made up of many generations the seller has never even met let alone know anything about short of bar room chat. Same with conformation better you go to someone with their own line and like us in obedience they in the conformation ring are the power of leadership not the followers. On the other hand if the initial purchase price is on the top of the list and you'll go with whatever you get, you will have unlimited sources for it is estimated that 98% of the Dobermans today are created by a private individuals who knows little more than you or perhaps you know more than the seller and that is all to common in business today. 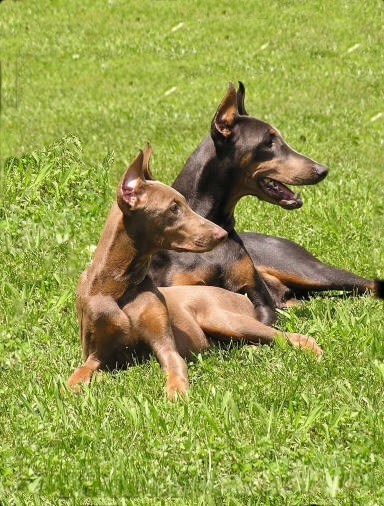 One out of every ten Dobermans in the American obedience ring is a Hoytt Dobe. 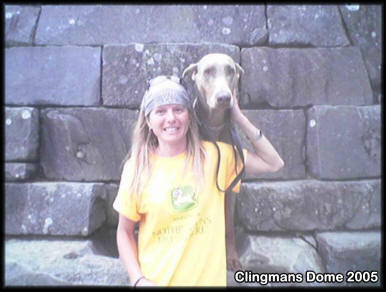 We have limited our placements since the mid seventies to an average of just four Dobes a month. It just seems like every beautiful well mannered Dobe you see is a Hoytt - well for the doubter start asking what Line the Dobe is from! The obedience ring..."The test track of the mind (temperament)"
Pictured on the cover of the 1962 Dog World Magazine Champion Hoytt's Colossus CD and his son Tri-International Champion Colossus Von Colossus CD presented not to impress you with the word CHAMPION, well maybe a bit but actually to offer documented proof that when we say we use the past genetic history of our lines in selection, we mean it. 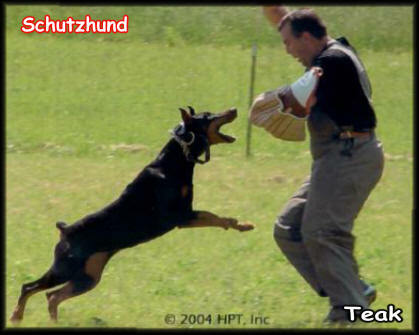 In our beginning we used the 'breed ring' to create our idea of excellence in body and to show those who already were the best of the best at the time that we were building our Dobes to their level of standards. In time we were welcomed into the winners circle, we became one of the Best of the Best and at that point we could ask for and did turn to the winners who had the qualities we sought for improvements in our Dobes until the day we had the structural foundation of the Hoytt Dobe of today. Anyway being around Dobes from about my third day of life I realized as I closed in on adulthood that Dobes just want to do things as a member of their family not just be "THE DOG" so in 1980 I turned to focusing on character or in the early years of breeding what was called Temperament and folks the obedience ring is the test track of the mind. Today I offer companions of uncompromising quality from pups to trained adults and I have the educators to match having titled more Dobes in performance than any other breeder to date. So if you prefer from day of arrival an educated kid to hang with we have that covered too. 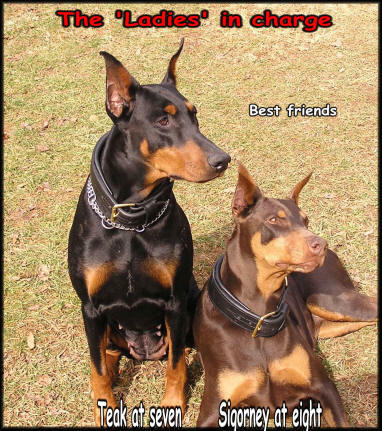 The Hoytt Dobe has appeared as cover dog on more dog magazines then any other blood line. 1968 saw the Hoytts offer the buyer a fully (per the needs of the times) medically completed Dobe crop included eliminating the unfortunate need for a new buyer to now try and locate with only a few weeks window a veterinarian who truly knew the breed, the crop variables and the best of the inoculations programs for the Dobe. 1976 CBS produced a 30 minute documentary Canines Against Crime ... Exclusively featured Hoytt Dobes in both the homes and the businesses they protected as guardians of the family to protectors of industry along with a look at the working of the kennel. 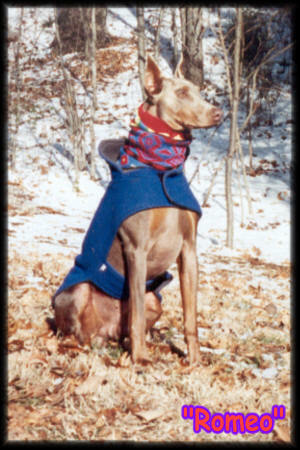 1978 presented in Dog World Magazine for $1,900.00 the first professionally educated Dobe before placement for the home justly called The Custom Young Adult. 1980 last time a Hoytt Dobe was shown to its Championship in conformation with our encouragements. 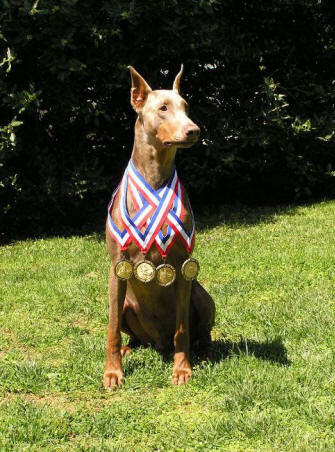 1982 we moved to east Tennessee and began exclusively showing off the Hoytt Dobe's mind with obedience and home refinements from our youngest SP1 graduate pups to the evolution of the new American working Dobe. 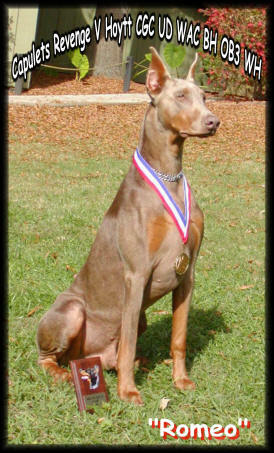 1998 three Hoytt Dobes all littermates received their CD titles at 6months 13 days of age setting new record but since then our Grand Victors have continued to remain the youngest to receive their CD degrees. 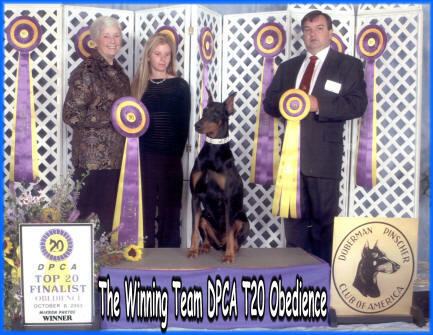 Since the 1998 wins of our kids finished it's CD degree at 6months two days of age at a two day show with a Doberman Specialty show allowing the pup to show in the DPCA show and both days same location under separate clubs - three different judges. 2000 our Grand Victor Program added Rally Obedience and the Canine Good Citizen certification extending also the in-home time by three months. 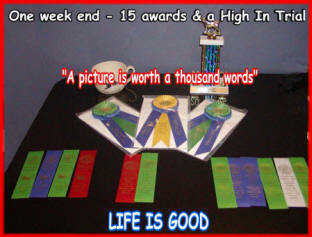 2010 the youngest dog to go high in trial the first time in competition also finished our Grand Victor program. Hoytts Twist of Fate CGC RN CD and will continue showing while serving as a Therapy Dog. To date more Champions from Hoytt have appeared as cover dogs on both general and breed specific magazines. 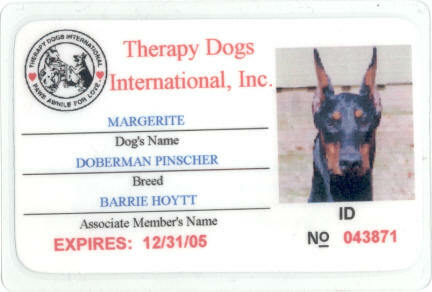 Hoytt Dobe was the first Dobe in the United States to receive certification in Accelerant Detection (CADA). Cooper formally Hoytts National Treasure CGC TN CADA also became the youngest dog to ever by almost a year to gain this degree and to date this honor remains. 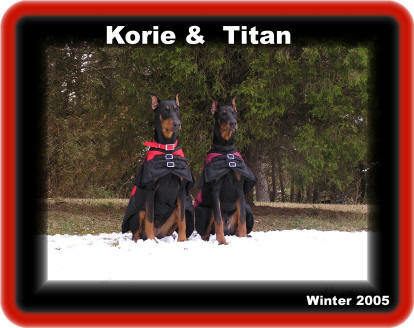 By mid 2011 we were the only kennel to see everyone of our current and younger future breeders, those that will bring in the next generation of Hoytt Dobes free of both negative DCM genes using the new (and only) DNA test for Cardiomyopathy. 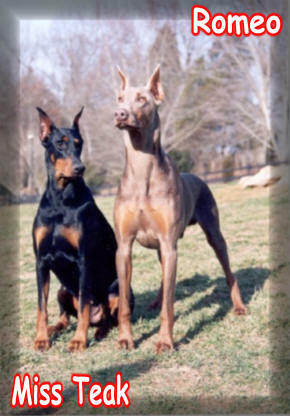 STRANGE BUT TRUE - if you are new to the SHOW world of the Conformation ring you can not show a Dobe neutered or Spayed even if you have the most outstanding example of the breed. In theory the clubs SIMPLY deems these dogs non productive since they can not make puppies WHY would anyone bother if no money can be made. Personally I have thought that each Dobe that shows itself off is a bill board for that breed or for the breeder of that dog but it seems that those in power are inferring the fixed Dobe is wasting the judges time. Why give it a win if it's not going to be available for breeding. But truly many of our clients while we were building champions had the time, interest and funds to go as far as their Dobe deserved. It does look like my perception when my folks began showing was to use the conformation ring like a upscale bill board. Now with the flashiness created in our early years a part of today's Hoytt Dobe and our continued success in the performance ring well established, I feel I've created a new breed...A HOYTT. But admittedly without Herr Doberman's experimentation there would be no Doberman so I'd best leave well enough alone and just enjoy the opportunity he unknowingly handed me. 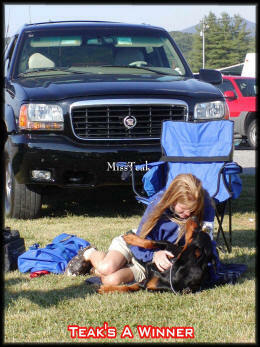 Second youngest dog to go High in Trial 2010 (Twist) also at her first showing. 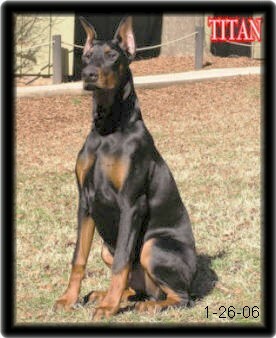 Third youngest Dobe to go High in Trial 2011 (Pepper) also titling without a single miss. 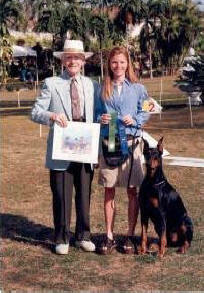 Fifteen years the most successful Dobe breeder in AKC competition obedience. The lead breeder of Dobes doing therapy work today. 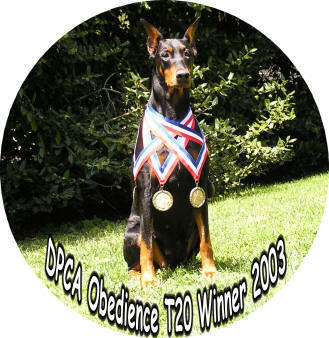 Summarized - one out of every ten obedience awards each year is given to a Hoytt Dobe. Owners of Hoytt Dobes who show personally out number all other Dobe sellers owners. 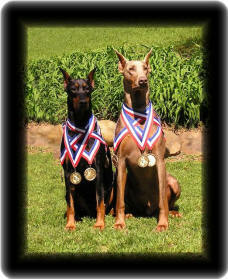 We have trained and taken to title in the AKC obedience ring more Dobermans than any other breeder in America. Selected to bring in "The Next Generation" ( from Chloe formally Hoytt's Deva of Destruction CGC, CD & WAC and Shotzi formally Hoytt's Devil in Disguise CGC & CD - both now privately owned. Titan completed the Presidents GV Program beginning the courses at nine weeks finishing his training and receiving his AKC Companion Dog title by eight months of age. Certification in just three showing with his third win also gaining him highest score in his class. 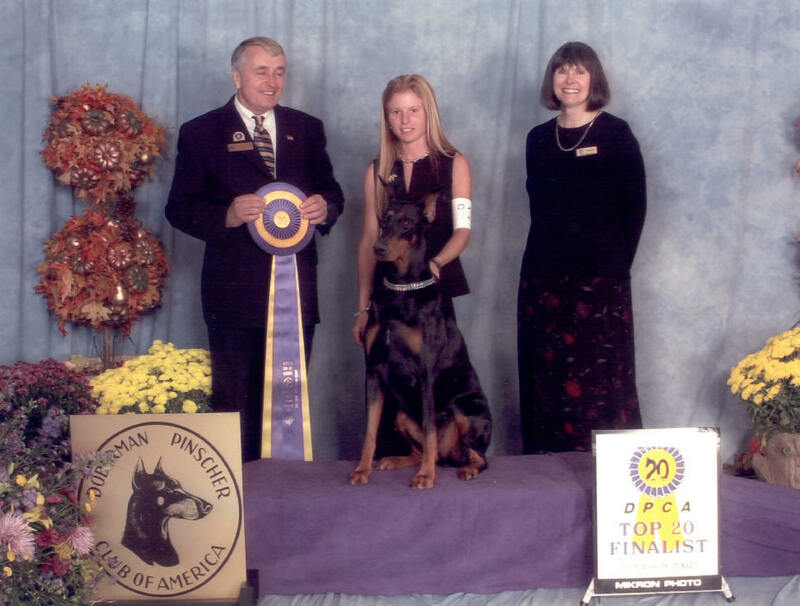 2003 Winner Doberman Pinscher Club of America National Specialty T20 run off held in Colorado Springs, Colorado.